Dr. Nina Tholuck completed her legal education at Bucerius Law School in Hamburg and Universidad Cardenal Herrera in Valencia, Spain. Subsequently, she was awarded the doctor of law (Dr. iur.) with a doctoral thesis on the volume of social plans in company groups. Employment and labour law were the primary focus of her postgraduate legal traineeship in Hamburg, Düsseldorf and Oslo, Norway. 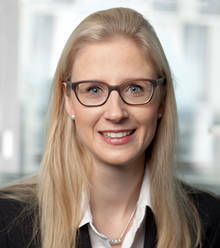 Nina Tholuck advises on all aspects of individual and collective employment law, especially on the preparation and realization of restructuring measures as well as all matters and issues related to works constitution and collective bargaining law. In addition to the advice regarding the termination of employment contracts she currently focuses on advising in the introduction and implementation of compensation schemes as well as in all matters of labor lease and the reintegration of employees returning from long-term illness. Member of Bucerius Alumni e. V.